A little over three years ago, Halo 5: Guardians launched worldwide. Over that time, the game has evolved in surprising ways, and provided competitive Halo fans with an incredible wealth of storylines, whether controversial or comical, incredible or unforgettable. It was never going to be easy to live up to the legendary lineage of competition established throughout the Halo franchise, but Halo 5 brought an excitement and level of team competition we hadn't seen in many years. 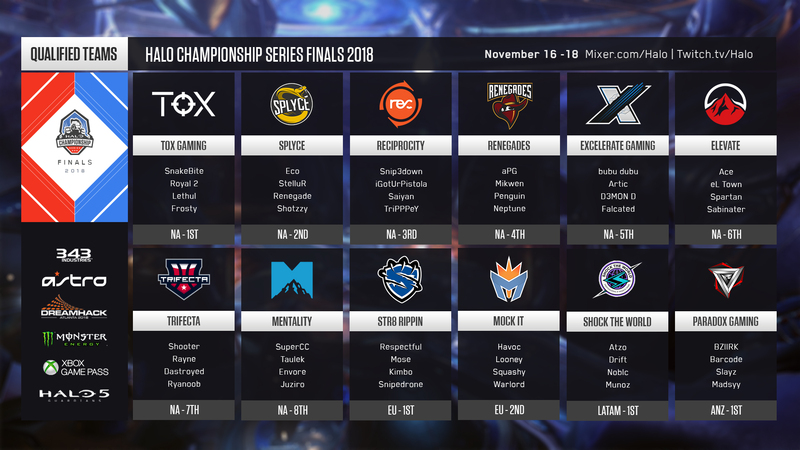 With that in mind, it’s only fitting that we celebrate the end of an era with a showcase of two of Halo’s most successful sporting chapters, as the Halo Championship Series Finals 2018 at DreamHack Atlanta will feature not only the absolute world-class talent Halo 5 has to offer right now, but also a Halo 3 2v2 competition that has legends from the past emerging from their proverbial cornfields. If you haven’t figured it out already, this weekend is going to be one to remember for a long, long time. Today, we take a look at all the details you need to be part of the experience, from the teams to watch, to broadcast times. During the show we'll be looking back at Halo 5's top competitive moments, sharing the winners of the player awards, revealing some news about the future of Halo esports, and we've got a few more fun things in store for the show as well. And as always, for in-depth information on event details, travel, and more, make sure to head over to the official Event Hub at halo.gg/hcsfinals2018. This broadcast will focus on the action taking place on the Main Stage but will also feature live check-ins to other featured stations, red-zone style, providing viewers at home with robust coverage of the most important matches happening at that moment. 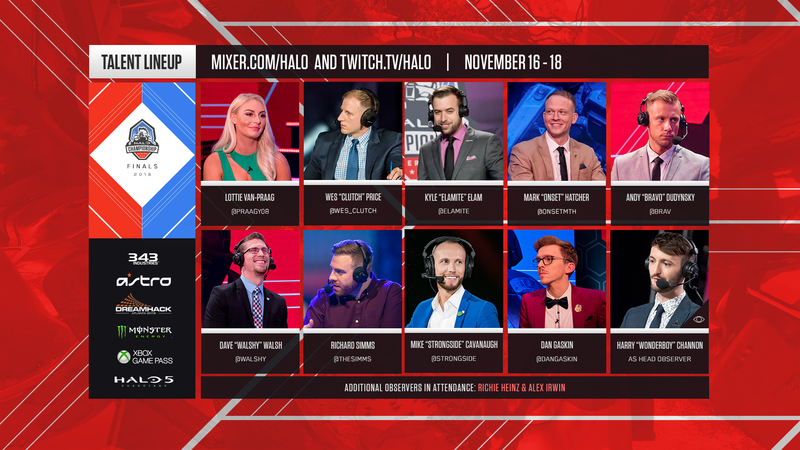 The Main Stream will feature a world-class lineup of outstanding Halo broadcast talent, showcasing some of the finest casters and analysts in the sport. In addition to the on-air talent, we’ve also got a stellar observer team that will be 100% dedicated to bringing viewers at home the absolute best experience possible. Led by Wonderboy and joined by Richie Heinz and Alex “KnightyKnight” Irwin, fans can expect seeing all the action from more angles and perspectives than ever before. The Gameplay Stream (Bravo Stream) will focus on a dedicated featured station, providing viewers with an additional avenue to take in top-level Halo 5 tournament action all weekend long. Matches showcased on the Gameplay Stream will be broadcast with a streamlined presentation, focusing completely on the action in-game. While the thrill of competition is enough to keep any Halo fan glued to their respective screens, we'll be revealing a few more details about what's to come for Halo esports in the future right before the Halo 5 Grand Finals on Championship Sunday. 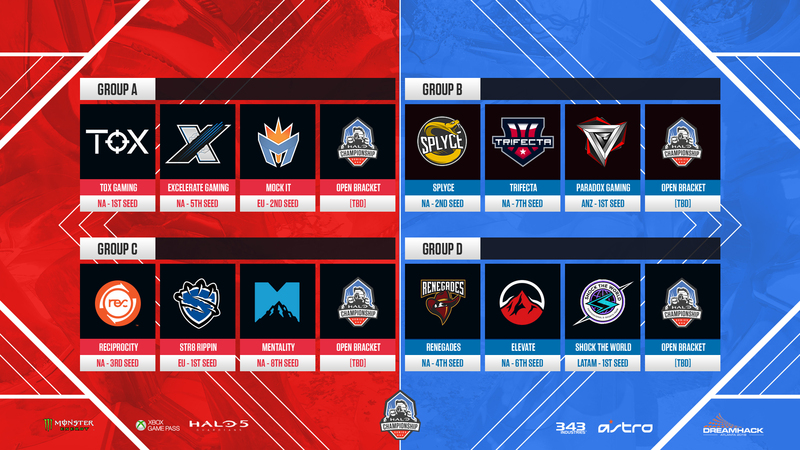 These twelve teams have been qualified directly into groups play based on a combination of results from both HCS New Orleans and HCS London, as well as performance in the online 2k tournaments leading up to the event. Splyce vs TOX: Episode VII? – In an amusing example of serendipity, it was DreamHack Atlanta last year at the HCS Summer Finals 2017 where we first got our taste of the Splyce vs TOX title tandem, with Splyce sporting a slightly different lineup and TOX then still known as OpTic Gaming. The young snakes came out on top that weekend and set in motion a streak of winner-take-all matchups that has brought us all the way to the current day. Since that tournament, every single eligible Grand Finals save one has featured the same titanic clash. And fun fact, the only team to interrupt that run? Team Liquid at DreamHack Denver – a squad that featured Eco and Stellur, half of Splyce’s current roster. In London, TOX ended Splyce’s run of four straight major tournament titles – a streak that included Splyce ending the TOX lineup’s own streak of Halo World Championship victories. 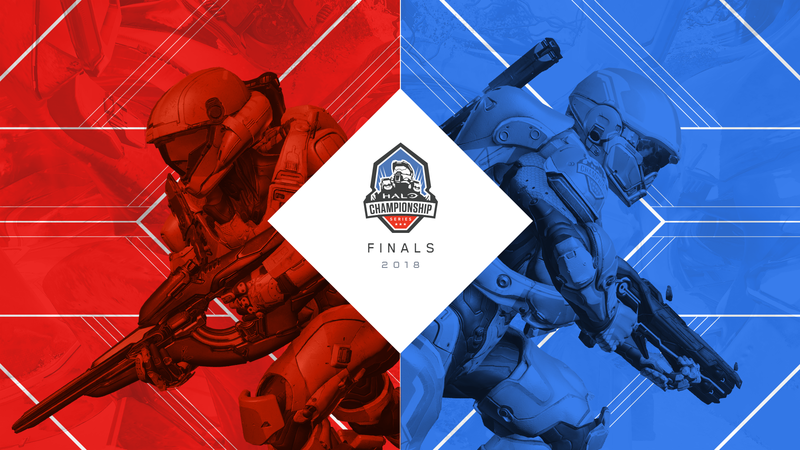 With official competition for Halo 5 coming to a close, will Atlanta be the site of this matchup’s own final chapter? Not so lonely at the top – Despite the impression that the aforementioned anomaly might give you, it’s not going to be easy for Splyce and TOX to walk away from the rest of the field – particularly the other half of Halo 5’s most recent Top 4. Both Reciprocity and Renegades sport lineups that at any moment could take the crown – if they could just put it all together over a single weekend. Both squads have had flashes of greatness with nailbiting finishes in London, and have both talent and potential in spades, but will either of them put together the dream run that has so far eluded them? 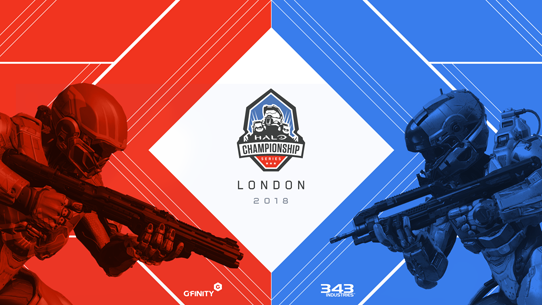 Are the HCS Finals 2018 their time to dethrone the current establishment at Halo 5’s finish line? Dark Horses – Further down the standings, there are even more teams eager to prove out how close the competition has become in Halo 5’s later lifespan. Teams like Excelerate Gaming have flirted with fame during online outings, while Trifecta put together a shocking Cinderella run in New Orleans that simply ran out of steam a bit too early. Add to the fray squads like Elevate and Str8 Rippin, and it becomes even more difficult to predict who might put together a legacy-defining run in Atlanta. What’s in a name? – On the international side, Halo 5 has also seen a shift in the balance of power, with the LATAM region owning the top foreign finishes over Europe and the ANZ for two events in a row. Leading the charge has been the trio of Atzo, Drift, and Noblc, who enter into the HCS Finals 2018 having swapped a teammate – picking up Munoz in place of Magico – and a nameplate, arriving at DreamHack Atlanta under the Shock the World banner instead of Berserker. Perhaps the change in name is indicative of exactly what this Mexico-based quartet intends to do this event. The HCS Finals 2018 at DreamHack Atlanta represents an interesting moment in time for Halo esports. All at once, we’re able to both celebrate the present by taking in the finest talent Halo 5 has to offer, while keeping an eye towards the future, when the next chapter brings adventures altogether new and different. Further still, the DreamHack Atlanta event allows us to celebrate Halo’s rich competitive history, and no more directly is that done than by the Halo 3 2v2 Showdown, a $10,000 tournament all its own that is slated to pit some of the best names to have ever picked up the sticks. Legends like Neighbor, GH057ayame, Flamesword, BestMan, and Roy will take on a ravenous field of combatants featuring Gabriel, Fantasy, Evadur, and more. All will be competing to leave their mark in the record books. The HCS Finals 2018 broadcast will bring you some of the best action available in the Halo 3 2v2 Showdown, letting viewers bask in the glory of legends let loose. 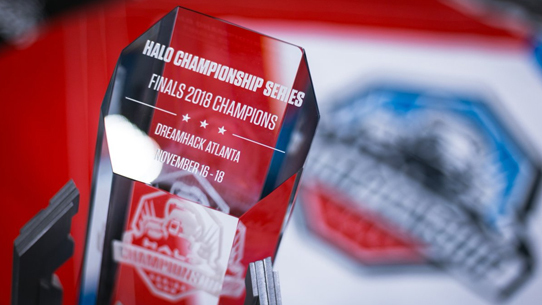 The HCS Finals 2018 at DreamHack Atlanta looks to put an exclamation point on the latest chapter of Halo esports with an incredible display this weekend. From top talent to relentless rivalries, there will be something to keep your eyes glued on all tournament long. The end of this particular Great Journey is nigh, and we can’t wait to share it with you. 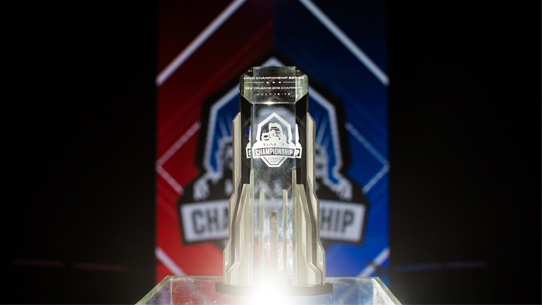 For all the latest on the Halo Championship Series, keep it locked to Halo.gg and follow @HCS and @Halo on Twitter. Plus, check out the awesome community-curated Halo Data Hive for updated player stats and match results.